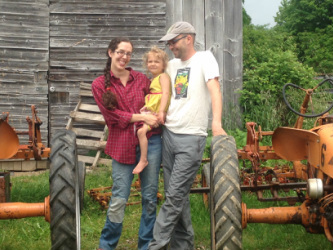 Caitlin and Jeremy Gildrien became farmers out of a love for food, our community, and the natural world. We believe that good food, raised well, can improve personal and environmental health while strengthening the local economy. We think it's pretty tasty, too! We met in 2004, while attending Prescott College in Arizona, and fell almost immediately in love. Caitlin graduated in 2005 with a degree in Agroecology; Jeremy graduated the next year with a Botany degree. We decided to explore farming shortly thereafter. We did a season-long apprenticeship with Paul Betz at High Ledge Farm in Woodbury, VT before striking out on our own. We started with a "practice" CSA of two members with what was essentially a very large garden; then we expanded to 17 CSA members and began selling at the Middlebury Farmers' Market. 2011 saw another expansion, including the birth of our daughter Sonora. After three years of farming on leased land, we bought a historic farm in Leicester early in 2012. This land had been a dairy in the '50s, then was the home of the Monroe family, who diversified the farm to include vegetables, maple syrup, and beef. Francis Monroe was active in local 4-H, the Middlebury and Brandon Farmers' Markets, the Addison County Field Days, and the local extension office. Though we did not know her, by all accounts she was a fixture of the local agricultural scene, and we feel honored to be continuing her tradition of producing good food for our community. Since purchasing this farm, we are getting to know the land, learning the best ways to grow on it, and undertaking the long-term investments in soil and infrastructure that are key to successful farming. In our first few years, we grew the size of our farm each year, increasing our CSA considerably, adding delivery to workplaces in Middlebury and Rutland, attending the Middlebury and sometimes Rutland farmers' markets, and selling wholesale to food co-ops in Rutland and Middlebury and joining the Deep Root Organic Cooperative. In 2016, we decided to take a year off from direct sales through CSA and market to focus on our wholesale vegetables and to try growing medicinal herbs for the new Vermont Herb Growers Cooperative. You can read more about our decision on our blog. Please get in touch if you would like to set up a wholesale account or have any other questions.